Heartburn. A burning sensation in the chest and throat. Regurgitation. A sensation of acid or food/liquid backed up in the esophagus. The esophagus, commonly called the food pipe, is a narrow muscular tube about 9.5 inches (25 centimetres) long. It begins below the tongue and ends at the stomach. The esophagus is narrowest at the top and bottom; it also narrows slightly in the middle. However, if acid and enzymes back up into the esophagus, its lining offers only a weak defense against these substances. Instead, several other factors protect the esophagus. The most important structure protecting the esophagus may be the lower esophageal sphincter (LES). The LES is a band of muscle around the bottom of the esophagus, where it meets the stomach. 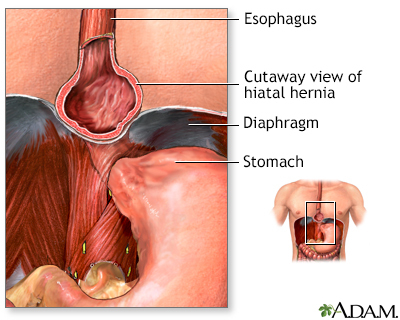 The hiatus is a small opening in the diaphragm (muscle that separates the chest cavity from the abdominal cavity) through which the esophagus passes into the abdomen, where it is continued with the stomach. The hiatus is normally small and tight, but it may weaken and enlarge. When this happens, part of the stomach muscles may protrude into it, producing a condition called hiatal hernia. 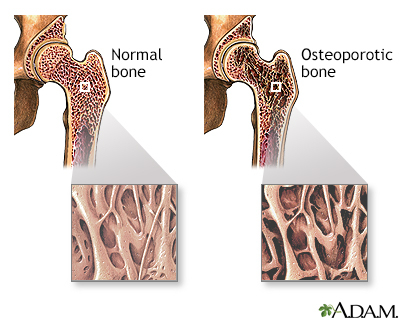 It is very common, occurring in more than half of people over 60 years old, and is rarely serious. It was once believed that most cases of persistent heartburn were caused by a hiatal hernia. Indeed, a hiatal hernia may impair LES muscle function. However, studies have failed to confirm that it is a common cause of GERD, although its presence may increase GERD symptoms in patients who have both conditions. Complications of StricturesIf the esophagus becomes severely injured over time, narrowed regions called strictures can develop, which may impair swallowing (a condition known as dysphagia). Stretching procedures or surgery may be required to restore normal swallowing. Strictures may actually prevent other GERD symptoms, by stopping acid from traveling up the esophagus. Acid leaking from the lower esophagus stimulates the vagus nerves, which run through the gastrointestinal tract. These stimulated nerves cause the nearby airways in the lung to constrict, producing asthma symptoms. Acid backup that reaches the mouth may be inhaled (aspirated) into the airways. Here, the acid triggers a reaction in the airways that causes asthma symptoms. Upper endoscopy, also called esophagogastroduodenoscopy or panendoscopy, is more accurate than a barium swallow radiograph. It is also more invasive and expensive. It is widely used in GERD for identifying and grading severe esophagitis, monitoring people with Barrett esophagus, or when other complications of GERD are suspected. Upper endoscopy is also used as part of various surgical techniques. Dyspepsia. The most common disorder confused with GERD is dyspepsia, which is pain or discomfort in the upper abdomen without heartburn. Specific symptoms may include a feeling of fullness (particularly early in the meal), bloating, and nausea. Dyspepsia can be a symptom of GERD, but it does not always occur with GERD. Treatment with both antacids and PPI can have benefits. 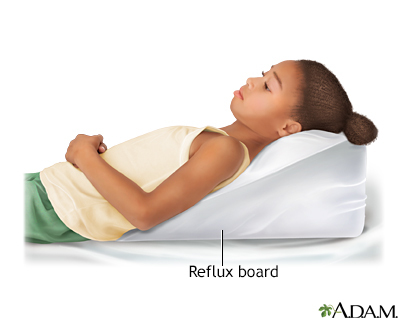 The drug metoclopramide (Reglan) helps stomach emptying and may be useful for this condition. Angina and Chest Pain. About 600,000 people come to emergency rooms each year with chest pain. More than 100,000 of these people are believed to actually have GERD. 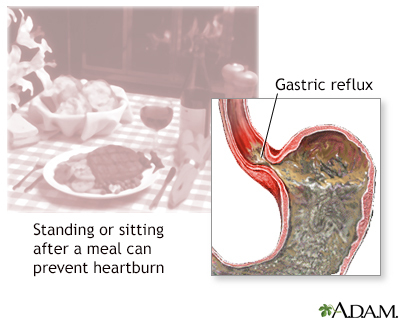 Chest pain from both GERD and severe angina can occur after a heavy meal. In general, a heart problem is less likely to be responsible for the pain if it is worse at night and does not occur after exercise- in people who are not known or at risk to have heart disease. It should be noted that the 2 conditions often coexist. Other Causes of Esophagitis. There are a number of other causes of esophagitis besides acid reflux. Infections such as Candida and other fungi or yeast and viruses such as herpes or cytomegalovirus may cause swollen and inflamed tissue in the esophagus. Certain pills may cause focal swelling and damage in the esophagus. Finally, a condition called eosinophilic esophagitis is an allergic or immune problem involving the esophagus. This latter problem is being diagnosed much more often recently. Other Diseases. Many gastrointestinal diseases (such as inflammatory bowel disease, ulcers, and intestinal cancers) can cause symptoms similar to GERD, but they can be diagnosed correctly because they produce additional symptoms and affect different areas of the intestinal tract. Step-up. With a step-up drug approach the patient first tries an H2 blocker drug (a drug that interferes with acid production), which is available over the counter. These drugs include famotidine (Pepcid AC, generic), cimetidine (Tagamet HB, generic), ranitidine (Zantac 75, generic ), and nizatidine (Axid AR, generic). If the condition fails to improve, therapy is "stepped up" to an 8 week course of a more powerful drug, like a PPI. Step-down. A step-down approach first uses a more potent drug, most often a PPI, such as omeprazole. When people have been symptom-free for 2 months or longer, they are then "stepped down" to a half-dose. If symptoms do not come back, the drug is stopped. If symptoms return, the person is put on high-dose H2 blockers. Some physicians argue that the step-down approach should be used for most people with moderate-to-severe GERD. Proton pump inhibitors (PPIs) suppress the production of stomach acid and work by inhibiting the protein in the stomach glands that is responsible for acid secretion (the gastric acid pump or proton pump). Recent guidelines indicate that PPIs should be the first drug treatment, because they are more effective than H2 blockers. Once symptoms are controlled, people should receive the lowest effective dose of PPIs. The Open Nissen Fundoplication ProcedureUntil recently, the Nissen fundoplication was the fundoplication procedure most often used for GERD. This is called an open procedure because it requires wide surgical incisions. With this procedure, the physician wraps the upper part of the stomach (fundus) completely around the esophagus to form a collar-like structure.